The instrument is composed of five gilt copper superimposed discs, the central of which has a handle in the form of a double dragon's head. 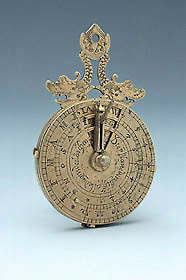 On one side is a brass arm with a pierced and decorated lunar volvelle. On the more external plate the border is divided in 31 (for the days of the month) and it is pierced so as to adjust for the month, showing its total days (indicated by 'DIE 12 MONET AVF ALE IAR'), the length of the night (indicated by 'nacht leng') and of the day (indicated by 'dag leng') and the ruling planets (indicated by 'DIE SONGETIM'). These are engraved on circles on the other plate underneath, which has also four notches on the limb for turning it. The other side of this plate is engraved with concentric circles. The central plate has engraved on this side 'I K' and 'leibi gasteig' but the inscription is not visible when the instrument is assembled. On the other face of the dial is a folding gnomon indicating common hours numbered from 4 to 12 to 8. On the opposite limb of the circle are the initials of the months and at the centre is the inscription 'Die 7 planeden stu alled agin des laschen'. The plate is pierced so as to adjust for the day of the week and to have the indication of the governing planet and its symbol, engraved in circles on the underlying plate. On the inner face of the plate is engraved 'Jah. 1564 Lub Soll'.